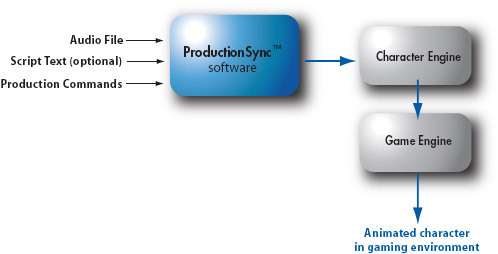 add ProductionSync to your process to virtually eliminate the turnaround time to get character animation synchronized. add ProductionSync to give your customers the ability to complete facial animation merely by dropping in the voice files. InstantSync software processes a real-time audio stream to extract the timing of phoneme sounds in the stream. This data can then be used to render a synchronized avatar that matches an incoming audio stream. InstantSync is used to enable real-time, voice-based chat with avatars in multiplayer gaming scenarios. 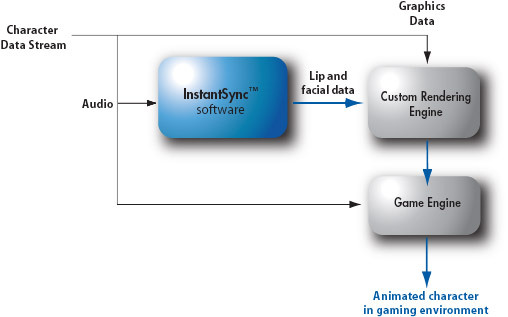 add InstantSync to your system to provide real-time lip movement information for avatar-based voice chat capabilities. Production Cues and Facial Gestures can be embedded in your written script text and automatically precisely positioned in time from your existing audio file. Production Cues such as "sword flashes" or "helicopter door bursts open" and Facial Gestures such as "raise_eyebrows#2" or "smile#4" can be automatically precisely synchronized in time from the audio file.